The thing I love about my MacBook is how sleek, elegant and beautiful it is. Every time I take it out from my backpack, I feel a flush of pleasure and pride. There is also a certain aura of authority and professionalism about it, especially if you are out there in Starbucks (or any coffee shop equivalent) for the public eye to judge you. Believe me - I had an old Lenovo before! It’s a good computer, but when you put it on the small coffee shop table it feels like just drove an old Volvo into a Ferrari parking lot. However, as every technology it comes with its own set of inconveniences and problems. One of those for me always was storage upgrade. I edit video (like a lot!) and I need a lot of storage. And yes, I know there are SD cards for that. It is true, but as I mentioned, what I love about my Mac is how elegant and sleek it is. Having a little piece of plastic sticking it out from the side ruins the beautiful integrity. It is like a pimple on otherwise perfect face, if you pardon the comparison, not crucial, but not appealing as well. You might think I am being nitpicky here, and well yes I am. I am a Mac user and a designer – what do you expect? Recently I found a perfect solution to this issue and it’s named mDrive. So called "stealth card" (sounds like ninja weapon, no?) fits seamlessly to a specific MacBook model. 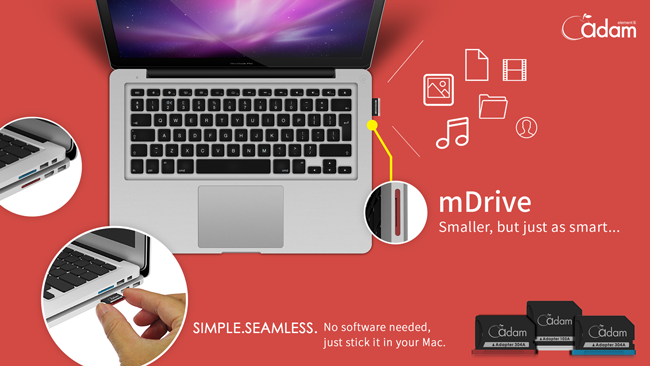 mDrive is fully compatible with Micro SD/SDHC/SDXC, it’s ultra lightweight and no software drivers or complicated hardware installation are required — simply stick it in your Mac and you have more space! This little fellow can be used as a regular hard disk drive or as a back-up device with the "Time Machine" application. Oh, and also, even with seamless fit to a Mac it doesn’t require any additional tools for removal (which would be a hassle) – it has metallic ridge and can be removed only with your nails. How neat is that! So, thanks to mDrive the integrity of my MacBook is in its perfection again. If you’re anything like me and want to have the best you can and deserve – this is something to look into.